After lamenting the lack of vegan bakes on Great British Bakeoff (particularly after I tuned in specifically to watch what I thought would include vegan baking), a friend challenged me to veganise Great British Bakeoff, a challenge I happily accepted. I made lemon meringue pie and deconstructed chocolate Kahlua roulade so far. This week brings us Tudor baking. The theme on the show this week was the Tudor era and saw contestants making pie, a biscuit called a jumble and a huge marzipan cake. I decided to tackle the pie, even though the versions on the show were very much vegan-unfriendly. Most contestants seemed to fill theirs with game, because obviously that’s what was done during the Tudor era, right? While the nobility certainly ate lard-laced, game-stuffed and over the top pies like the ones presented on the show, the Tudor poor most definitely did not. Like most eras, the poor of Tudor times ate a mainly vegetable-based diet, because they couldn’t afford meat. In fact, even beyond that, there were rules specifying which class was allowed to eat which foods. Tudor peasants mainly subsisted on pottage (a soup of vegetables, normally thickened with oats), seasonal vegetables, a coarse bread made with the grains available to them and occasionally meat. The nobility, on the other hand, ate huge, rich feasts with lots of meat and plenty of sugar. Sugar was very expensive so they liked to show off their wealth by creating huge displays of it in the form of giant marzipan cakes. They didn’t eat many vegetables (those were relegated to the lower classes) and fruit was thought to be dangerous if eaten raw, so many of the wealthy developed scurvy (oops!). 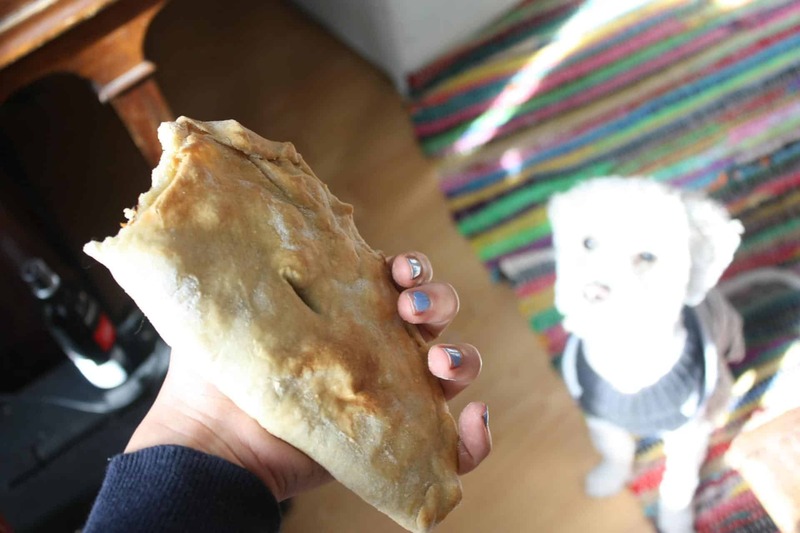 Pasties are believed to have been invented in Cornwall in the 14th century, and the original pasties likely didn’t contain meat which wasn’t added until a few hundred years later. 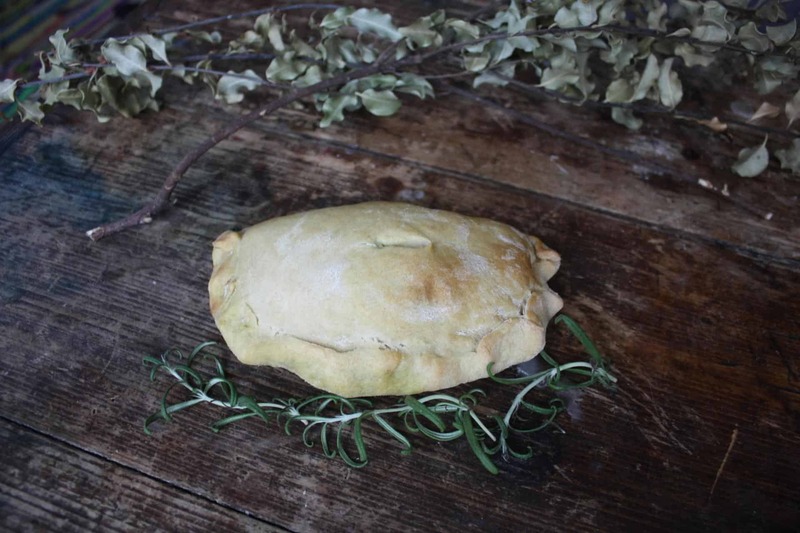 Of course, the vegetables that were included in pasties in the 16th century are different to today’s, because some vegetables (like potatoes) were unknown in Europe in Tudor times! Common vegetables in the Tudor era were turnips, cabbage, onions, leeks, cauliflower, carrots (though they weren’t orange then!) and spinach. Tudor cooks used fresh herbs they found or grew, including sorrel, mallows, parsley, sage and thyme. In the spirit of Tudor peasant baking, I used what I had to hand, and made my pasties with onions, carrots, leeks, parsley, sage and carrot tops (I doubt they would have let those go to waste!). Unlike Tudor chefs, I made a shortcrust pastry with margarine. The pasties were really tasty, although the pastry got a bit dry without a sauce or gravy. I made a non-Tudor batch at the same time that I filled with onions, leeks and broccoli plus a cashew cheese sauce I made — absolutely delicious (I used this sauce minus the Mexican spices). But if you want to be truly Tudor, leave that cheese sauce out. I doubt Tudor peasant cooks had any sort of sauce at their fingertips. And remember, your pasties should be GIANT, approximately the same size as your dog’s head (unless you have a St Bernard). Rub the margarine into the flour. Add enough water so that the dough just comes together. Mix together and form into a bowl. Place in a bowl and cover, and chill in the fridge for around 20 minutes to an hour. Heat olive oil or vegetable oil over medium heat and saute the onion, leeks and carrots (or whatever vegetables you're using!). When the vegetables have started to soften, add the carrot tops, rosemary and parsley (or any fresh herbs you're using) and saute for another minute, mixing to combine. Remove from the heat. Preheat the oven to 390 F/220 C/200 C (fan assisted oven)/gas mark 7. Divide the dough into four equal portions. Roll them out, one at a time, on a lightly floured surface. They should form large circles (around 23 cm in diameter). Cover half the circle with filling and fold over to form half-circles or moon shapes. Pinch the edges together, brushing with a little water if you need to to get the dough to stick together. Crimp the edges and brush the pastry with non-dairy milk if you want a glaze (this is optional, but replaces an egg glaze). Repeat with each piece of pastry until you have four pasties. Place on parchment paper lined or oiled baking trays and bake at 220/200 C fan (390 F) for 20 minutes. After 20 minutes, reduce the oven heat to 180 C/160 C fan/320 F and bake for another 10-20 minutes or until the pasties are just starting to brown. Use whatever vegetables and herbs you have to hand, as the Tudors would have done. If you want to veer slightly from Tudor tradition, this cheese sauce (minus the cumin, paprika and cayenne, which give it more of a nacho cheese flavour) makes a great addition to the pasties. 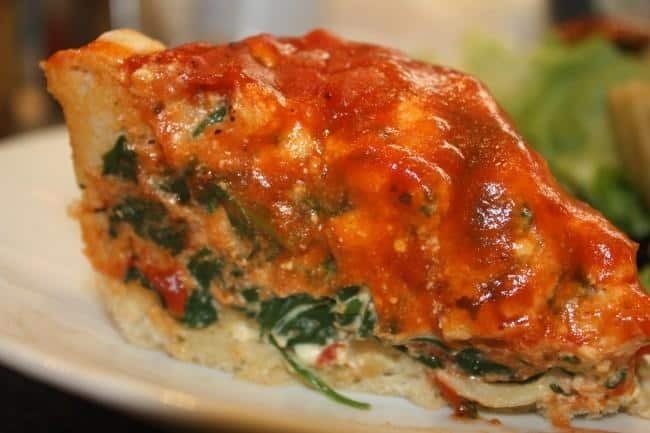 Mix with the cooked vegetables in a large bowl before spreading onto the pastry and baking. The pasties should be large and basically a meal unto themselves. Have one for lunch on its own or serve with some steamed or roasted vegetables for dinner. I’m not 100% sure about the Tudor pastie but the cheesy pastie variation sounds amazing! Yeah, the Tudor pastie was…interesting! Made me feel for the Tudors and their lack of interesting vegetables and herbs! The cheesy one was amazing though, I keep wishing I’d made more of them! The ‘traditional’ method of making a Cornish-style pasty (vegan or otherwise)) is NOT to pre-cook the contents, but to allow the thinly sliced vegetables to steam gently within the pastry case over a period of fifty to sixty minutes. This also helps to keep the pastry from drying out – no sauce is required. It took me many years of soggy pasty-making before I discovered this ‘secret’!